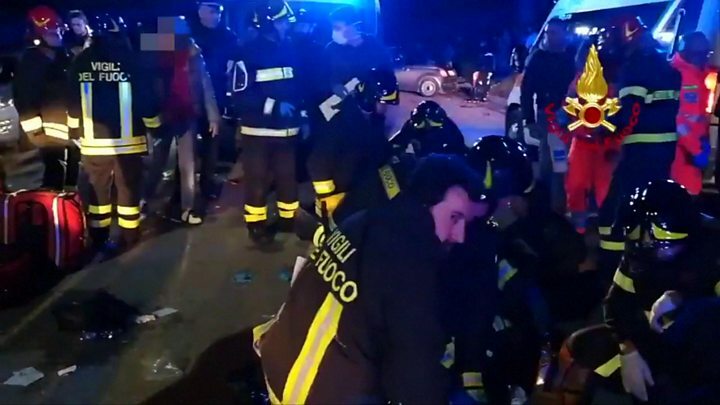 Six people have been killed and dozens have been injured, 12 of them seriously, in a stampede at a nightclub in Italy, officials say. Some reports say there was panic after pepper spray was fired inside the club in the town of Corinaldo, near the eastern coastal city of Ancona. Up to 1,000 people were inside the Lanterna Azzurra club attending a concert by rapper Sfera Ebbasta. Five of the victims were 14 to 16 years old. The sixth was a 39-year-old woman. She had gone to the club with her daughter. The incident took place at about 01:00 (midnight GMT) as Italy began celebrating the Feast of the Immaculate Conception. The concert had not yet begun when "acrid smell" forced crowds to rush towards the emergency exits. The accident occurred after railings gave way and people began falling off a walkway. Many of the injured suffered crushing wounds and broken limbs. The injured have been taken to hospitals in Senigallia and Ancona. Seven are said to be in intensive care. Interior Minister Matteo Salvini said investigators would try to find out if overcrowding was also one of the causes. The hall had a capacity of under 900. Sfera Ebbasta is the stage name of 26-year-old Gionata Boschetti, who has achieved significant commercial success in Italy. He released his third studio album - Rockstar - in January and it has been certified as a triple platinum seller by the Italian musical federation. In June last year about 1,500 people were injured in Turin after a firecracker sparked a stampede at a public screening of the Champions League final.